is capable of providing. Fiber easily offers the higher bandwidth needed to prepare the network for the much higher speeds projected for the near future. 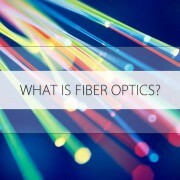 The use of fiber optics is not just limited to communication networks. Cable and telephone providers often use fiber for its distance capabilities. Distance is also an advantage to industrial plants that use vast amounts of fiber primarily for its noise immunity. Utilities also prefer fiber for noise immunity, security and high bandwidth properties. The military uses fiber because it’s nearly tap-proof and impossible to jam. Fiber is even used by the aviation and aerospace industries because of its smaller size and weight. you can only transmit about 90 meters (less than 300 feet), thus requiring more telecom closets in each building. With fiber, you only need passive patch panels locally to allow for moves. Upgrades can be rather difficult with copper wire, but not with fiber because the real capacity of fiber is only partially utilized at today’s network speed. Many use fiber to connect all their central offices and long distance switches because it has thousands of times the bandwidth of copper wire and can carry signals hundreds of times further before needing a repeater. The cable and telephone providers use fiber because it gives them greater reliability with the opportunity to offer new services, like digital phone service and internet connections. They also use fiber for economic reasons, but their cost justification requires adopting new network architectures to take advantage of the fiber’s strengths. Should I get involved in the Fiber Optic Industry?Whether you are considering a career in fiber optics or not, it is still important to get involved. Experts now believe that a vast majority of future home, business and entertainment advancements will include fiber optics and opti-electronic devices. Even the basic, most inexpensive on-line or classroom course will prepare you for understanding your future and no doubt will help you in your future work environments.